If I had to pick one animal to eat for the rest of my life, it would be of the porcine variety. Hams, salami, sausages, pork chops, roasts- all are my idea of heaven. There is one part of the pig that I find completely boring on its own. That is the tenderloin. Pork tenderloin is one of the leanest meats available. It is as low in fat as a chicken breast. 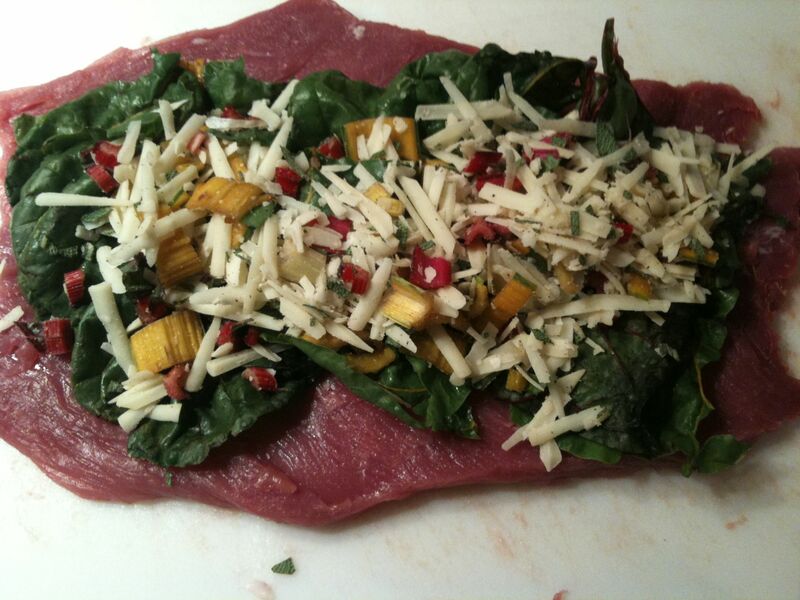 The tenderloin is part of the loin, and you can usually find it sold vacuum packed at your local grocery store. Because it’s so lean, it is pretty flavorless (ALWAYS REMEMBER THAT FAT IS WHERE THE FLAVOR IS!!!). Just because a piece of meat is boring and a bit flavorless, doesn’t mean that you can’t make something awesome out of it. The best way to achieve awesomeness with pork tenderloin is to stuff it with awesome stuff. (That last sentence is weird, but you get the idea). 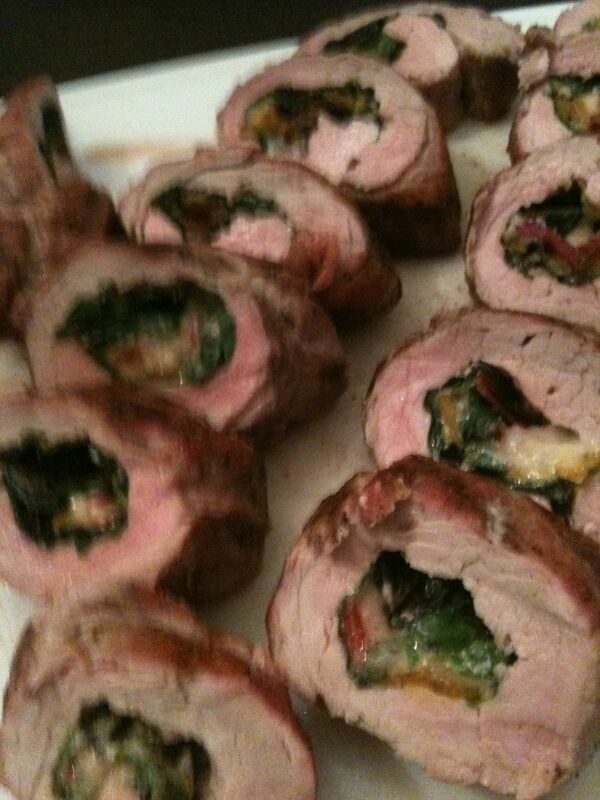 To stuff tenderloin, first you have to get angry. Trim all of the sinew and silver skin off of the meat. That basically is the stuff that looks like it won’t be good to eat. Once that is all done, slice the meat halfway down the center, like you are going to cut it in half the long way. Spread the tenderloin open and flip over. Now is when your anger comes in to play. Place a piece of wax paper over the loin and FLATTEN IT! Use a frying pan, use a meat pounder, use a meat mallet- I don’t care how you do it, just beat that meat! Flog that tenderloin! Smack that pork! Hmmm… can’t think of any other double entendres. Once it’s good and flat, lay it out, and season it with some salt and pepper. Then get creative and come up with a stuffing. The picture below is some rainbow chard, garlic, and parmesan cheese. A little trick I learned was to make a layer of leaves from a vegetable and put the stuffing on that. It makes the rolling a lot easier. Rolling? Yes, rolling. 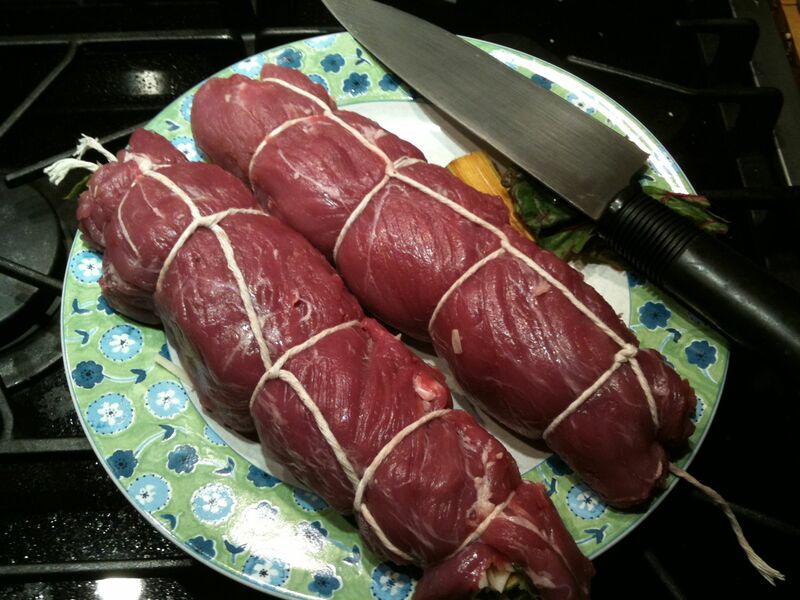 Once you have your tenderloin stuffed, roll it up and tie it with butcher string. Here is an amazing little video on how to tie roasts. It makes you look like a total professional. Once you have these bad boys rolled up, it’s time to cook ‘em. I’ve done them in the oven and on the grill. With either method, I like to sear the outside over high heat and then slowly cook them with indirect heat until the inside is at 145 degrees. Then, let sit, covered with foil for 5 minutes before slicing them up. BE CAREFUL not to overcook. Because the meat is lean, it will dry out fast if left in too long. Awesome blurry iPhone photography skills. This is another proof to my theory that if you add cheese to anything, it makes it awesome. Gonna try something like this soon, Tom. I’ll let you know what stuffing I come up with and how it turns out. Definitely let me know. This is really an awesome way to use a relatively flavorless piece of pork… and it’s pretty easy.